As the farmer’s neighbors continued to shovel dirt on top of the animal, he would shake it off and take a step up. Pretty soon, to everyone’s was amazement, the donkey stepped up over the edge of the well and happily trotted off! So what do we learn from the Jackass, you ask? Life is going to shovel dirt on you, all kinds of dirt. The trick to getting out of the well is to shake it off and take a step up. Each problem is a stepping-stone. We can get out of the deepest wells just by not stopping, never giving up! Shake it off and take a step up. That is of course what the story is all about; being able to shake things off when the dirt pile up on you. Here is the problem. 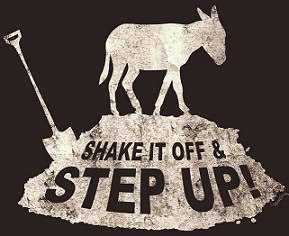 The donkey likely shook the dirt off because it bothered him and it was what he had always done when dirt got on him. It is a singular act of habit. Even stepping up was habit as he had dirt under his feet. We give credit to the jackass for quieting down and figuring out he was going to escape this way where the reality was he was repeating a habit. WE do so much of that. When it works we are effective, when it doesn’t – well things may not go well. The thing I want you to ask about as a human being and not a Jackass (though of course many of us at times emulate this noble beast of burden) is “if just shaking my back does not work, is there anything else I can do?” The answer is yes of course and in a large part it is what mental training is all about. Giving you strategies’ and skills to get yourself out of a pit so that you can perform so well that you rarely fall down that deep a hole ever again. 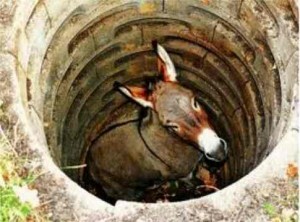 If a jackass can learn to get out of the well, so can all of us. It is just a matter of knowing how. Not all pits are life threatening like the well the donkey fell in, but we all find ourselves dealing with things in sports that get in our way. I work with an athlete now recovering from an injury and she is totally frustrated. The harder she works, the tighter her quad gets and signals her brain to stop. When she relaxes, she can go on and complete the game. Another is so concerned with getting a scholarship that he thinks about every shot he takes on goal. His fear is if he misses, he won’t be recruited to the DI school he wants to go to. Another athlete was so filled with anxiety she could not finish (she learned to and got accepted to an Ivy League school). All it took was learning how to toss off the dirt in a new way, because the old way wasn’t working. There are many ways, come learn some new ones to boost your performance. The same skills by the way apply to the business world. Want to learn about some of these skills? Mental Training is for everyone. It’s not magic and it is not an instant fix, it is science based educational skills and strategies to allow you to perform at your best in sports and business. Find us at The Mental Game.